Probably one of our most requested features is for reinforced concrete design modules for beams and columns under ACI 318, AS 3600 and Eurocode 2. These design standards stipulate the requirements to design a range of concrete elements of a structure. These are in addition to the other design standards already supported by SkyCiv. As a first release, we are looking for feedback to improve the product and are looking forward to continually improving the software! Likewise, if you'd like to see any additional modules added, please contact us at anytime! Standalone software is used without the need of an integrated analysis software. Simply enter in the sections and reinforcement, apply the loads and instantly review the results of your reinforced concrete design checks. Having this design check software fully integrated with our powerful structural analysis software means all your loads, dimensions and materials are imported directly from your analysis model. It allows the engineer to check all the concrete members with a single click of the mouse. Integrated software is extremely powerful and fast way to model your structures. Having your model completely integrated means you can make changes to your model and instantly check the results with your local design standard. What will the Output be? 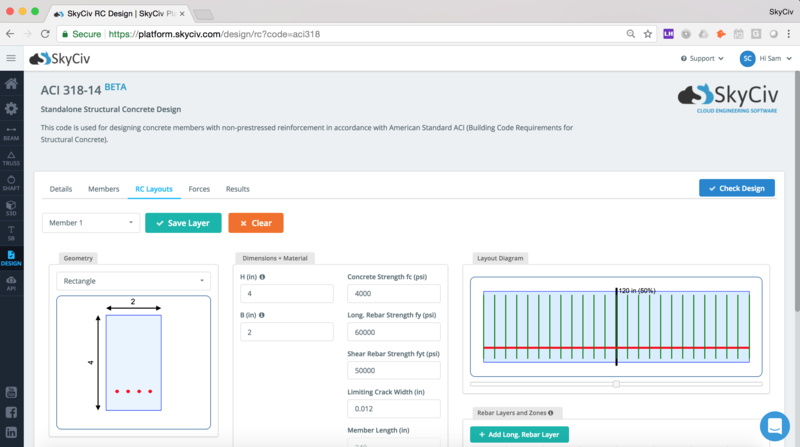 SkyCiv's detailed reporting allows engineers to review the calculations in this detailed, step-by-step report. The report will show the calculations, assumptions, code references and criteria of the design checks, so the engineer has all the information they need about a particular design. An excerpt of the detailed calculation report produced. Click here for a sample report.